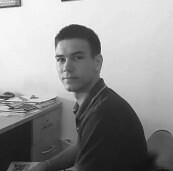 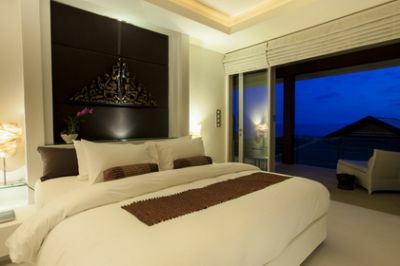 Price per day USD 450 – 700++, depending on the season. 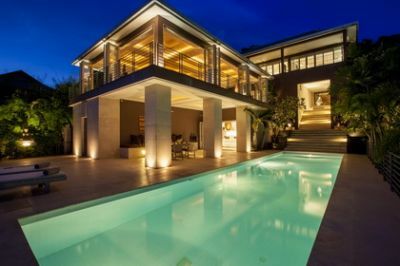 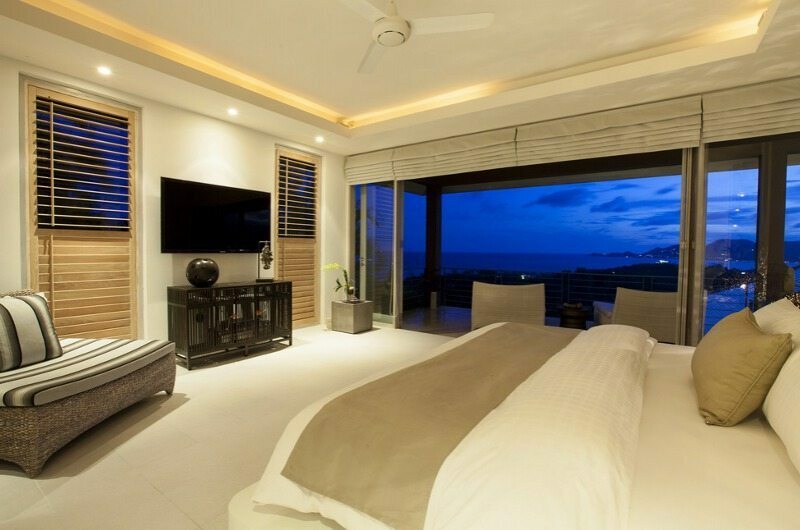 The villa is a supremely stylish luxury hillside villa that makes the most of its dramatic location overlooking Samui’s famous Chaweng beach. 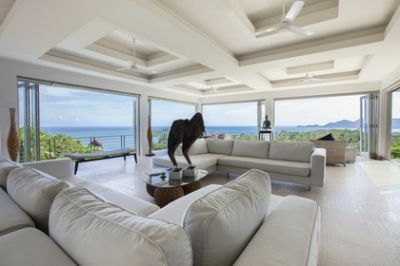 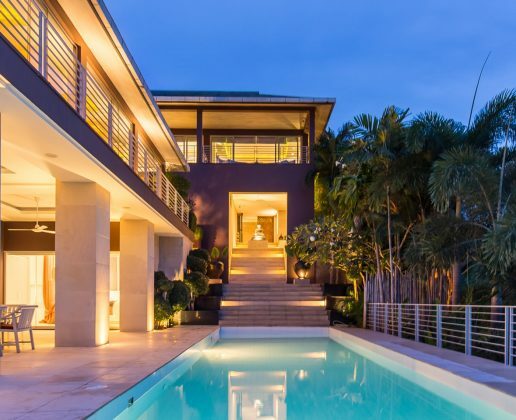 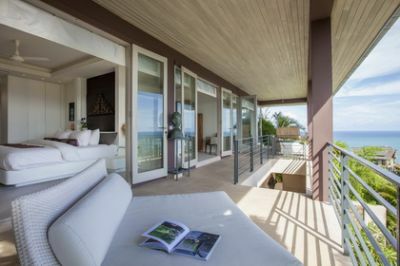 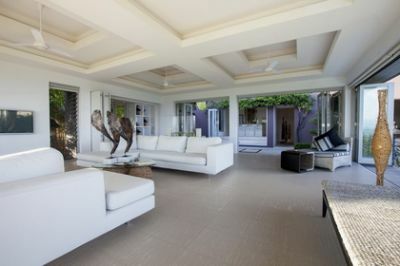 The villa’s contemporary tropical architecture blurs the distinction between in and outdoor living, with fold-open living spaces and bedrooms, wrap around covered terraces and an expansive pool deck offering guests a constant connection to the incredible island views. Generous, bright living areas and top quality finishing at Baan Fan Noi are complemented by sophisticated, comfortable furnishings, leading edge entertainment systems and top-of-the-line facilities throughout, making for an extravagant private holiday experience surrounded by breathtaking natural beauty, yet within easy reach of the island’s best restaurants, nightlife and shopping options. 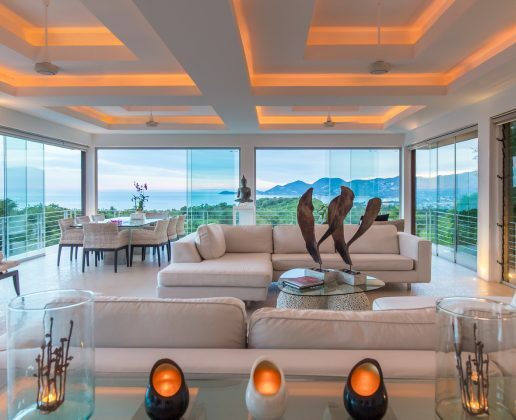 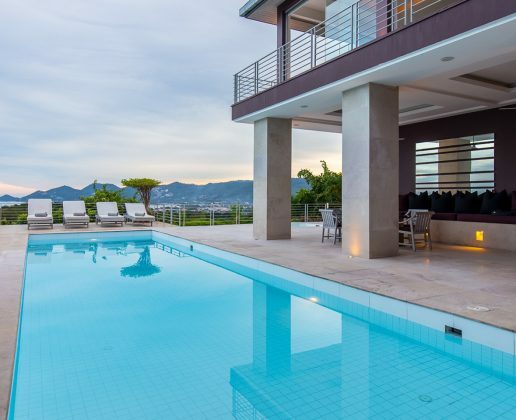 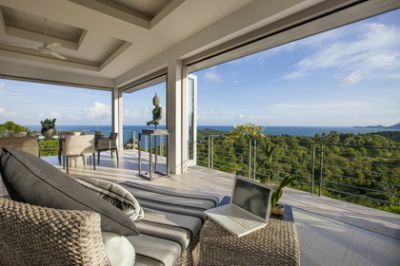 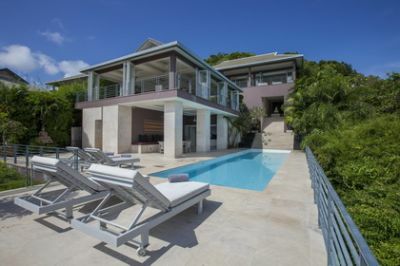 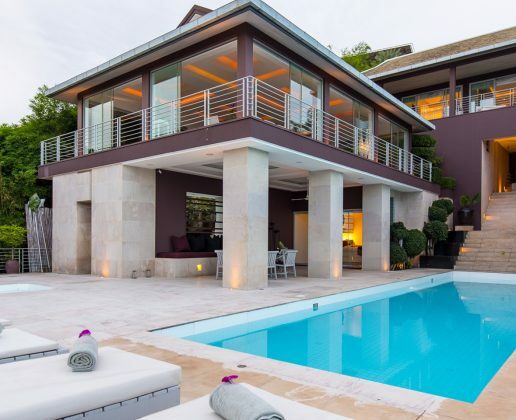 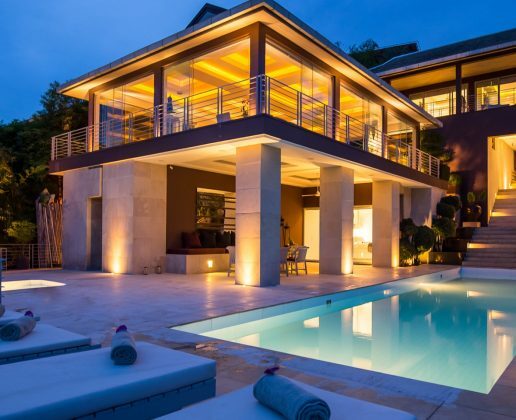 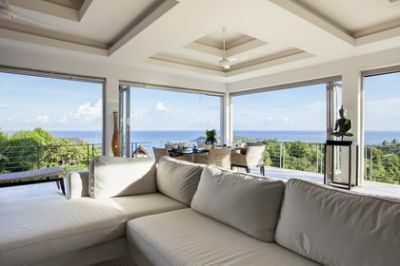 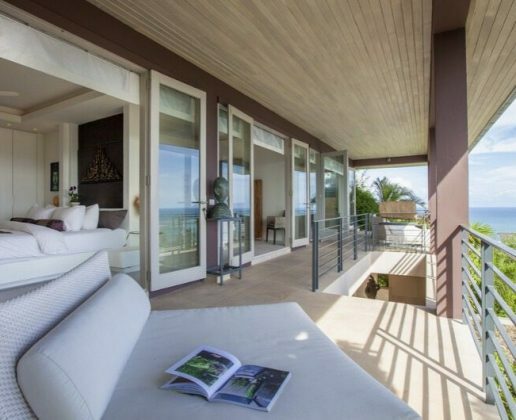 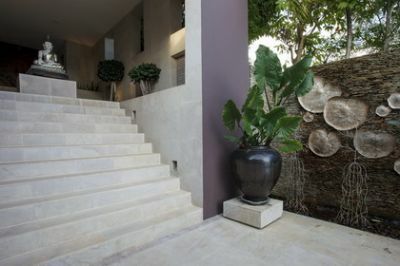 The villa is built over three floors, each connected by limestone stairwells on a beautifully landscaped, ocean-facing hillside with jaw-dropping views from every level of the house. 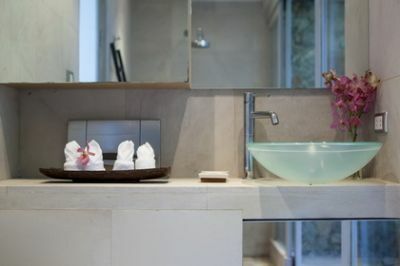 The upper floor features three, well appointed air-conditioned double bedrooms subtly decorated with attractive Asian influenced art and artefacts. 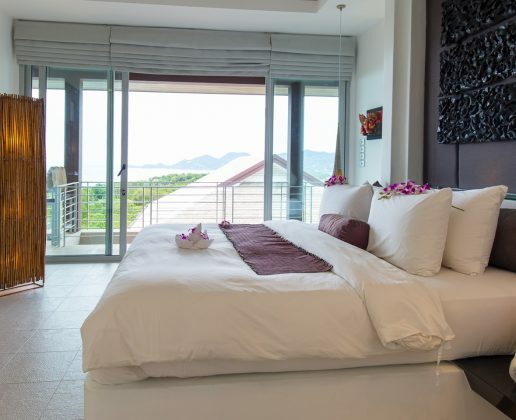 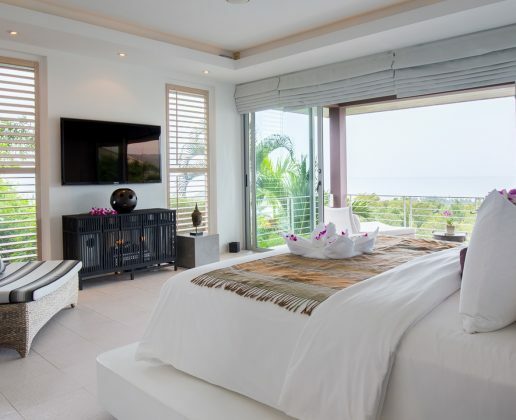 The master suite is the largest room, but all three bedrooms slide open onto wide seaview balconies creating an appealing sense of space and drawing in the cooling sea breezes. 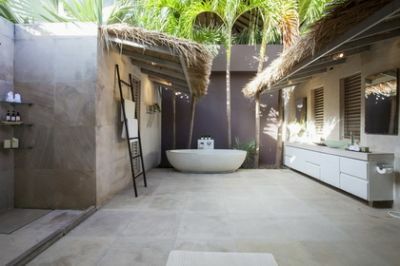 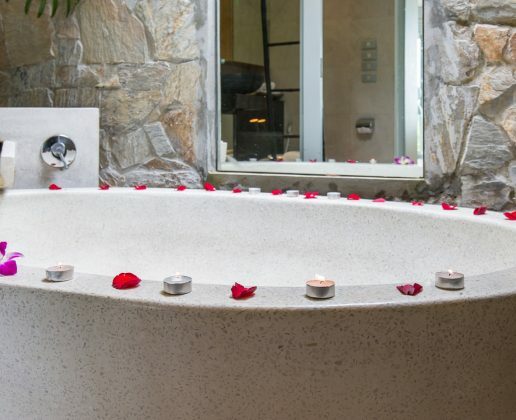 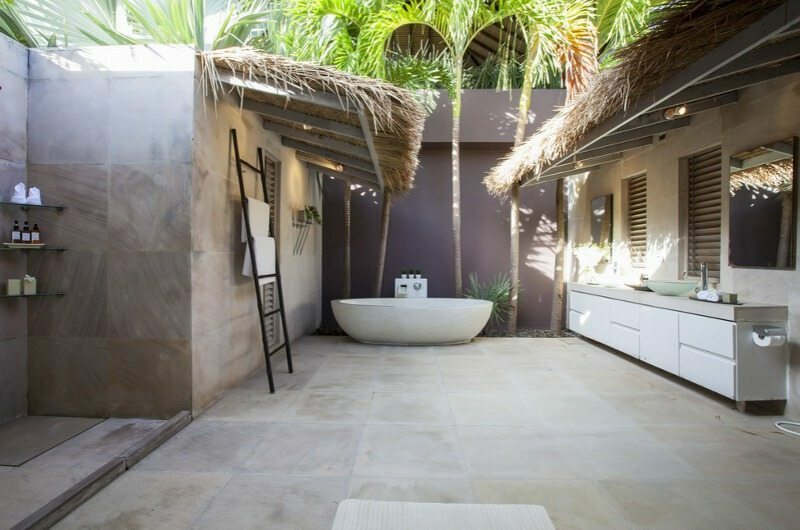 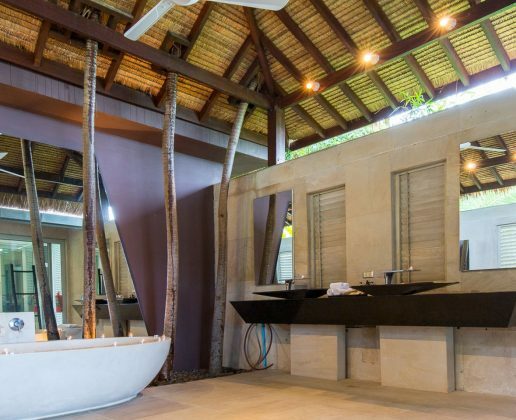 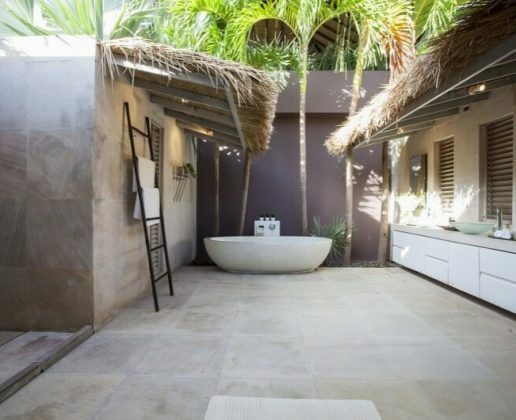 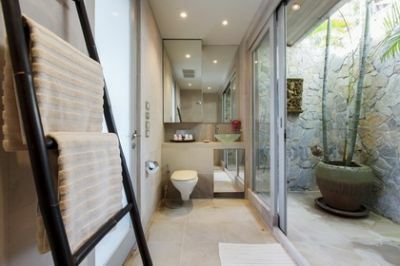 Each bedroom is also connected to its own walled, outdoor bathroom with rainshower, two of which also feature standing terrazzo bathtubs for the ultimate private soak. 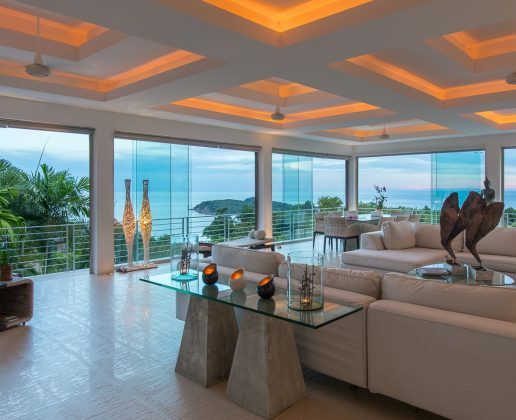 The airy middle floor comprises an expansive living room, beautifully lit at night with concealed lighting and literally folding open from the floor to the ceiling onto the stunning seascape views. 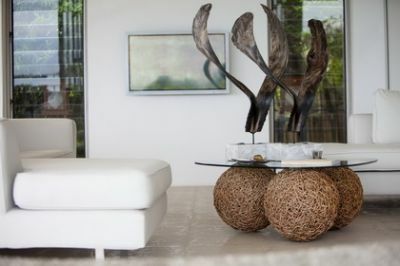 The room is furnished with plush sofas and also boasts state-of-the-art audio visual systems, as well as a concealed bar, making it ideal for sophisticated social gatherings. 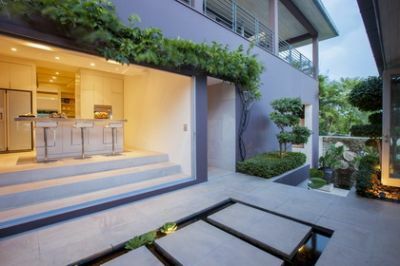 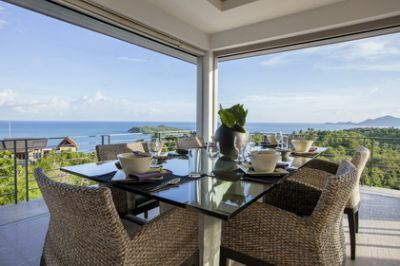 The attached dining area seats up to eight and is also bathed in arresting island views, while cross a small courtyard with cushioned outdoor seating there’s a separate, fully equipped modern kitchen with breakfast bar. 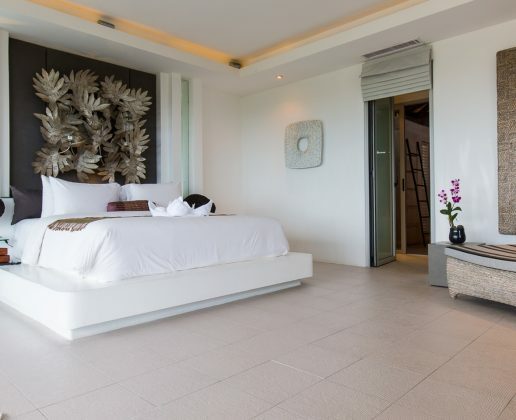 The lower level at Baan Fan Noi offers guests an ideal spot for daytime relaxation and sun worship, with a generous limestone terrace furnished with sun beds surrounding the villa’s tempting 18 metre pool — the latter reaching out towards the ocean and blue horizon beyond. 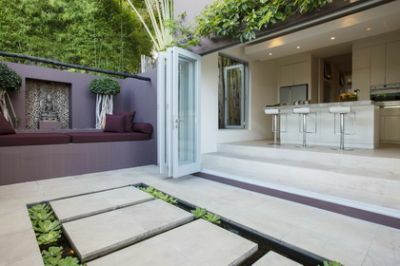 A covered outdoor lounge space provides further cushioned, shaded comfort, plus a second dining table for alfresco meals, and there’s also a sunken Jacuzzi and open-air shower. 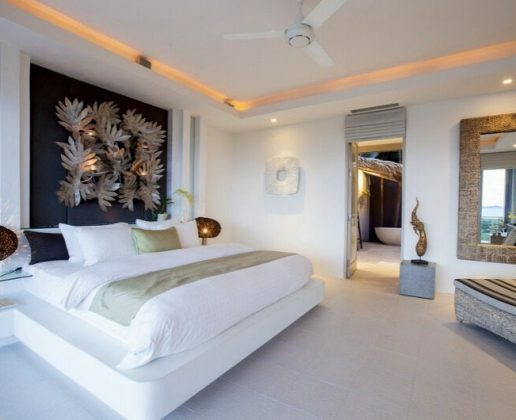 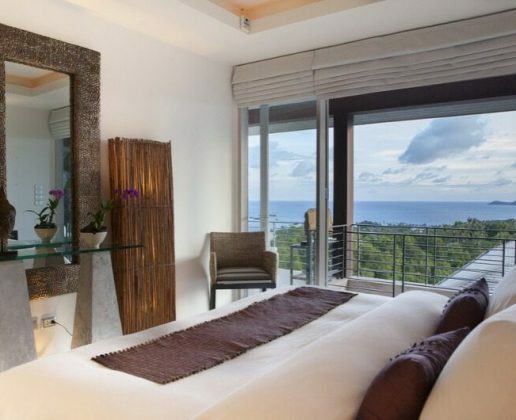 The villa’s fourth en-suite double guest bedroom sits directly behind the pool terrace and features a unique circular bed and built-in wardrobes. 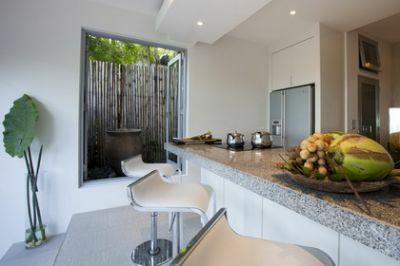 The smart, contemporary design scheme at Baan Fan Noi not only suits the location but also combines three distinctive, spacious living spaces in one. Days drift by in complete comfort on the lower level pool deck, as you switch effortlessly between your sun-bed, the cooling pool and shaded lounge, never leaving blissful holiday mode. 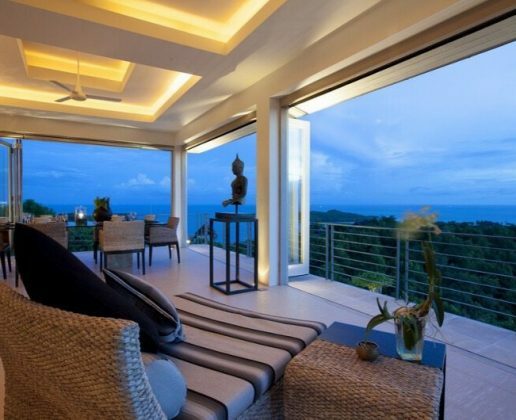 As the sky turns crimson it’s equally easy to move upstairs to the lounge area and toast the fabulous sunset before sitting down to an evening feast prepared to order by the in-house staff. 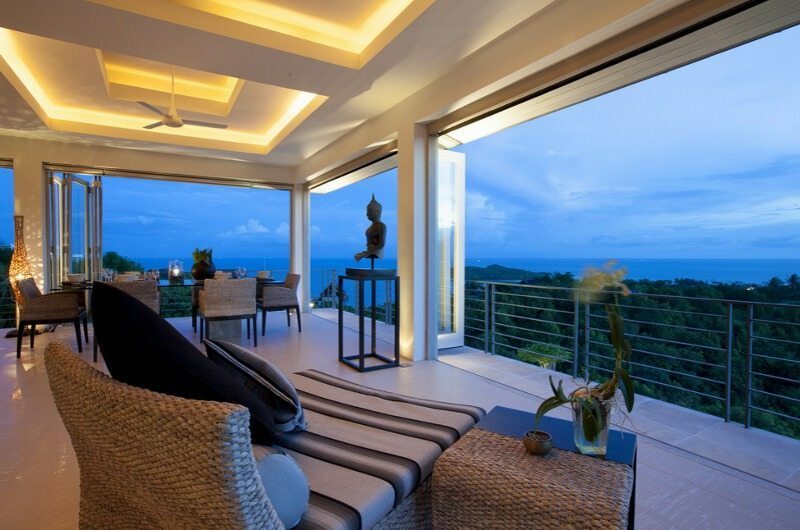 The food is made all the more delicious by the fresh ocean breezes and canopy of stars overhead. 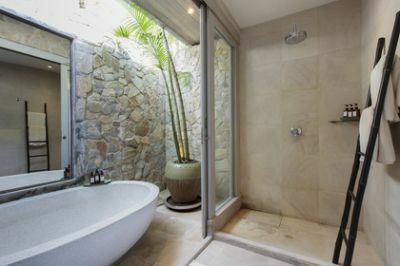 After watching a DVD on the wall mounted plasma screen, a few more stairs take you to a soothing private soak or cleansing rainshower, followed by peaceful slumber, all the time surrounded by gentle nature. 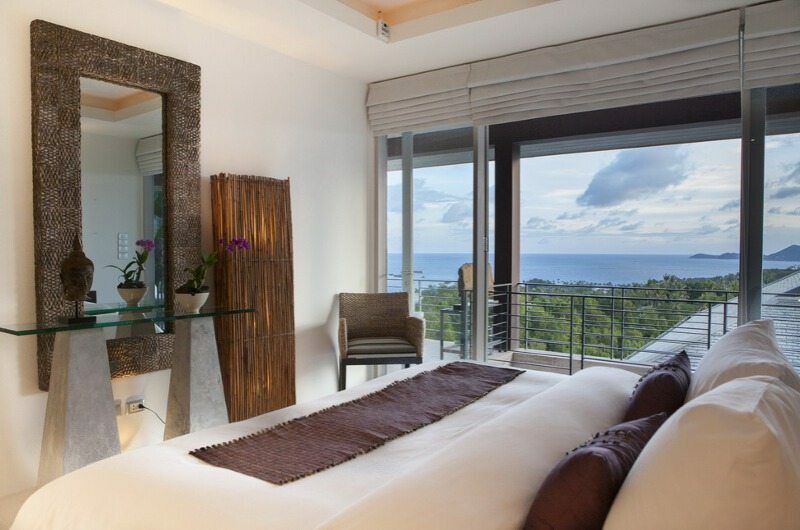 The incredible coastal views also offer an inspiring sight to wake up to in the morning. 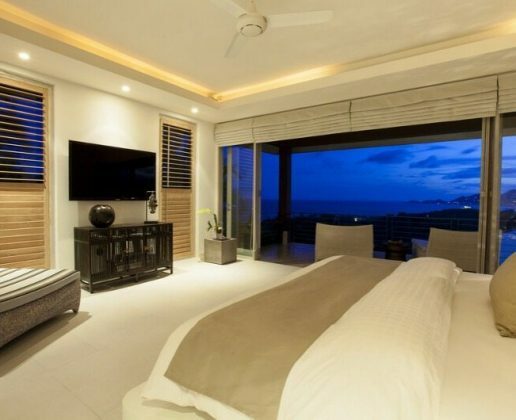 The located on a lush hillside around 5 minutes’ drive from the main Samui Ring Road at Chaweng, making the villa a perfect base. 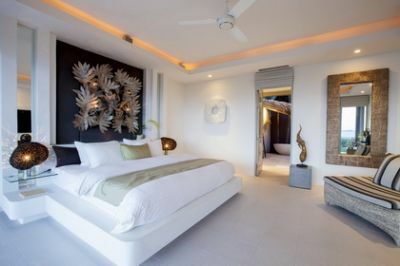 Another 5 minute drive takes you to the island’s most popular bustling beachside strip, while the airport is only 15 minutes north, as are the boutique bars and bistros of Bophut Fisherman’s Village. 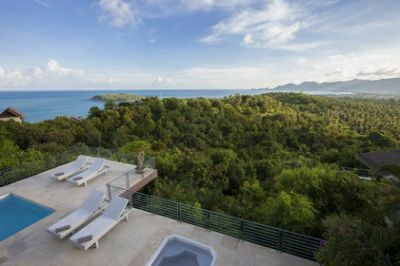 The villa’s location allows guests to easily combine more boisterous holiday fun with untroubled down time in their own relaxing luxury retreat.